Blurb: Being a hero is a choice. 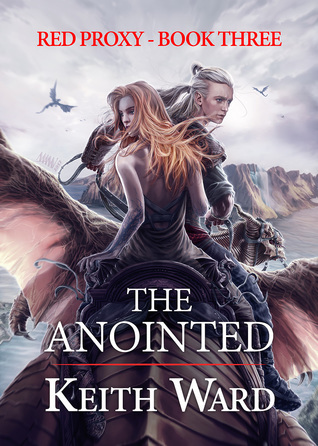 The Anointed by Keith Ward is a fresh fantasy that has some very unique and thought-provoking themes discussed that intrigued me to no end. And although I did quite enjoy reading it, it also had some issues and areas that didn’t entice me as much as I wanted, making this read a pleasurable one, but not one that I completely fell in love with. I think it’s the story itself that I enjoyed the most. The idea of the Transfers was so interesting–the practice that you could read the life span of a person once their born and, if you deem yours too short, Transfer what’s left of their span into your own, making them a Proxy; it really captured my interest from the start. As a magic system that was in the middle of being challenged and questioned morally/ethically by some characters within a society that usually deemed it acceptable and used it often, it was probably one of my favorite aspects of the story. I would love to read more about that and sort of wish the plot was more focused on that revolution, honestly. There were also a few characters I was really partial to. Plyonia, surprisingly, really captured my attention and I found myself rooting for her and wished she was more of a major character, rather than a minor character (despite the fact that she does have a POV). I really enjoyed Greengrass, her adventurous nature and the way she responded to the world as she discovered it. Kertram I also had a soft spot for, because he’s obviously just trying his best, no matter the situation. Overall, I enjoyed this read. I thought it was a pretty easy read, in the sense that the pages flew by as I read them, and I enjoyed the story and most aspects of the plot. But, as I mentioned, there were just some elements I wanted to be stronger, in order to fully invest myself in this story. Similar to my review of Symphony of the Wind, I thought The Anointed was jammed packed with a lot of good quality plotlines…but perhaps too many for one novel, to fully give each one the attention it’s due. Or too many POVs telling it. There are some threads that are completely dropped (like Imbis searching for a Proxy for her Xinlas and hiring a bounty hunter to do it; I was definitely expecting more to come from that, and then it never got brought up again). Sometimes, large chunks of time pass between one POV, leaving the others left on the wayside, before picking back up. In same cases, this could work, but I felt, sometimes, too long an amount of time would pass without knowing what was going on, thus also leading to dropped threads for long periods of time. Then, when switching between POVs, sometimes, we’d go back in time to see a different character’s perspective on something we already know the resolution of, which took away any potential tension, even though it’s from a new POV. Due to the complexity of the plot and how many sub-threads were going on–plus all of the voices telling it–I think some narrowing in might have helped focus the story and drive it forward, instead of creating a web that I often lost track of. I also thought character development could have been amped up a bit. Without going into spoilers, at times, characters responded in ways that didn’t make sense or the way they were written felt two-dimensional instead of how a fully-fleshed-out character would feel (particularly with dialogue). I thought Xinlas’s arc in particular was the most lacking for me and the ending, a little too far-fetched (I also hated his arrogance and how I couldn’t find a single redeeming quality about him; I hated him from start to finish, and that was hard, especially as he was the central, main character we’re first introduced to). Actually, it was the ending that I didn’t really enjoy, thanks to this lack of strong character development, in my opinion. It felt to resolve itself too quickly and without the emotional impact I should have felt, making it feel…a little lackluster, in comparison to what I’d hoped we were building to. Lastly, with the writing itself, repetition played a little too huge a role for me. Ideas, thoughts and phrases were often repeated in short spans of text multiple times, presented in different ways unnecessarily, just bogging the reader down with information we already knew, instead of moving forward. There was also some capitalization and italicizing formatting that took me out of the story. I realize, reading a large chunk of criticism like that, would make it seem like I didn’t enjoy the story, which isn’t true at all. I actually really did enjoy this story! I found it to be a pleasant reading experience and I’m glad I read this book. I just also had a lot that I had trouble with, which happens, sometimes, despite enjoying the read as a whole. I look forward to seeing how this author grows, though, and continues improving his craft! The ideas are there and the promise is great. He’s definitely on my radar as an author to watch out for. I think you enjoyed this one more than I did – I felt like I had so many little issues that they really bogged me down. Some very interesting ideas though. Oh, I can totally see that! For some reason, I was able to look past those issues (for the most part) but I still felt there were quite a few in the book that stopped me from falling completely in love.